For forty years “Les Ballets Trockadero De Monte Carlo” (Trocks) hasn’t been taking classical ballet very seriously… and that’s the good news. 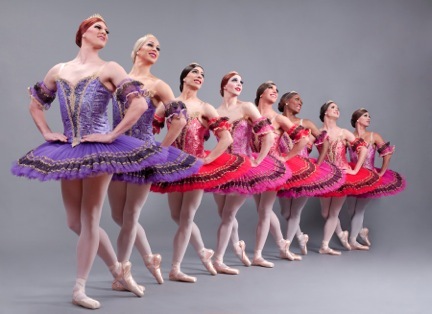 The all male company “en pointe” does, however, continue to take their makeup, tutus, and careers dead serious, especially if that gives them the freedom to be a PRIMA Donna…MAJOR prima donnas. To no surprise, they are at their worse as a corps de ballet with collective timing consistently a bit off, as in this performance of “Esmeralda” and “Paquita,” and corps lines are seldom… dare I use the word… straight? But then, how could they be when the transparency of individual ambition is so conniving? Why bother lining up perfectly, on the mark in a row of anonymous dancers when you can claw your way to the top for a ten minute solo curtsey as Princess Odetta/Queen of the Swans, Olga Supphozva (Robert Carter) or as a dying molting swan, Eugenia Repelskii (Joshua Thake)? Yes, molting swan, with feathers falling out everywhere until the swan chokes to death by its own feathers, as seen in the “The Dying Swan” that ended the second part of this program. “Les Lac Des Cygnes” (Swan Lake, Act II) has always been the ideal vehicle for the Trocks to take their revenge on classical ballet. They have so perfectly adapted this iconic ballet to suit their dark needs that you would think Tchaikovsky had them in mind when composing. Olga Supphozva (Robert Carter) a physically dense, muscular Princess Odetta milks every moment of the piece smiling joyously through heavily weighted arabesques, dizzy pirouettes and gives the ballet term “attitude” and entirely new meaning. Supphozva’s ensemble of swans meticulously dance around her, coyly eyeing her and at the same time ready to cut her throat and step into her point shoes at any moment. Meanwhile, she tolerates Prince Siegfried danced by Sergey Leggupski (Giovanni Goffredo) advances and lifts as a princess should and abuses the mink Benno, Roland Deaulin (Chase Johnsey) as a princess can. Sheppish Benno has a hard time keeping up with Odetta let alone lifting and carrying her manly weight. The second act in this program, which only listed “Pas de Six” (from Esmeralda) in the program notes, actually included a tour de force exhibition by Alla Snizova (Carlos Hopuy) and Araf Legupski (Laszlo Major) in “Le Corsaire Pas de Deux.” Snizova hit each pirouette with stunning acuity and lightness while Legupski, looking like Nijinsky with a serious six-pack, athletically executes tours en l’air the way Nijinsky was known to do. This pas de deux had the least amount of slapstick and the greatest amount of precision, showcasing the two dancers handsomely. “Pas de Six” (from “Esmeralda”) felt sluggish, missing both the light heartedness of “Les Lac Des Cygnes” and the preciseness of “Pas de Six” relying instead on gimmick. One of the lead roles, performed by Lariska Dumbchenko (Raffaele Morra) was less buoyant than his performance in the third act of “Paquita” where his lyricism, humor, and chest hairs (sprouting over his tutu bodice) shined more brightly. What the Les Ballets Trockadero De Monte Carlo does best is remind us that watching classical ballet, which is often a very serious affair, doesn’t have to be. That there is great laughter and joy to be found in this crazy art form that the world has adapted to like the emperor’s new clothes. And, that hefty ballerinas can make up for their natural earthboundness by dancing “en pointe” as if it doesn’t matter.